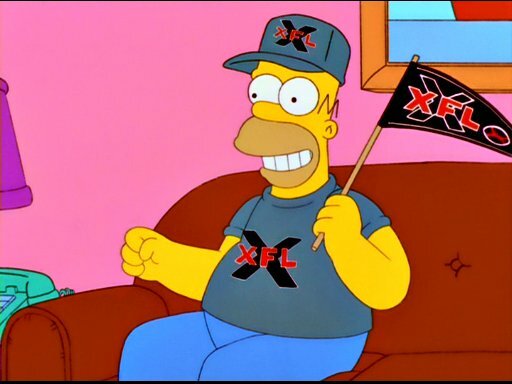 Okay, I know what you’re thinking… “the XFL was one of the biggest flops is sports history.” That might be true in some aspects, but lets roll it back just a little bit. What was the XFL? The XFL was intended to be a major professional sports league complement to the offseason of the NFL. Started by Vince McMahon (World Wrestling Entertainment CEO), it was a joint venture with the then WWF and NBC. It seemed like a smart idea at the time. Using WWF’s production standards to broadcast football when no other football was on TV seemed like a sure-fire win. And with NBC and UPN broadcasting those games during primetime, what could go wrong? The opening game on February 3rd, 2001 drew very high ratings for NBC, a 9.5 Neilson rating which was double what was expected. The XFL was also going to try and be very different from the NFL. They wanted to be known as “Smash Mouth Football”. They had less rules, more hits, encouraged taunting, a race/scramble instead of a coin toss and less penalties. The league also had impressive television coverage including having the coaches and players microphoned, more cameras on the field, and camera in the dressing room. They provided a truly 360 experience that at times felt like you were watching a movie about football. Once again…what could go wrong? The XFL only lasted a single season. Vince McMahon opted to shut down the league after NBC failed to renew it’s television deal. With no primetime TV slot, the league wasn’t worth the costs to maintain. Despite it’s high initial ratings, the games rapidly declined throughout the season and was ridiculed by sports journalists. Some journalists criticized the quality of gameplay and players, which was fair. The league consisted of the rejects, players who couldn’t make the cut in the NFL or even CFL. Other journalists were quickly to dismiss the project because it was the brainchild of Vince McMahon. McMahon has always been the joke of mainstream sports journalists because of his “fake” wrestling company. And he only made matters worse by infusing himself and superstars of the WWF into the XFL broadcast, even at times featuring pre-taped segments and storylines. Some believe that if he distanced himself from the on-air and kept it more about the football, it might have had a fair chance. In the end, the XFL is a funny chapter in the world of sports. But it did leave a positive contribution. The majority of broadcast techniques, camera angles and audio that the XFL brought to the table, the NFL quickly adopted and now brings to its viewers. You can thank the XFL for improving how we watch football. He should do an IPO and make it a publicly traded company. A league owned by the fans… No need to have broadcast partner as these day internet broadcasting is highly feasible… We live in a different world now… One ready for the XFL! I was season ticket holder for the Enforcers. They packed Soldier field for the last game of the season and it was a BLAST. Bring it back!!! !